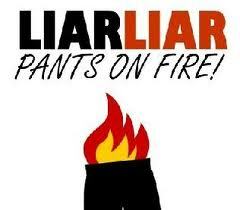 Liar liar, pants on fire! No, Mr. Liar’s pants are not on fire. In fact most liars are making fortunes by selling alternate reality. Times have changed and we no longer have the face to tell children, “It’s bad to tell lies.” The truth about lying is that it has become pandemic. The biggest liars are the advertisers who promise the earth and the sky. Their claims never cease to amaze me. When a nondescript university screams that their placements are better than IIMs, is it not a lie? When a deodorant claims that dousing Axe will have women all over you, is it not a lie? Then, my cynical mind looks for *, the little stars printed in small fonts which reveal that the map not to scale, sale on selected items,or conditions apply! But the advertisers will not accept that they are molesting the Truth. They simply indulge in smart deceptions imperative to attract attention. Fine! Even smarter are the pollies who guise their lies in the wizardry of words. In the parliament the honest head of the most corrupt government admitted to the CVC appointment as an ‘Error of Judgment’. Dr Singh, I am sure you know that ‘Truth’ is not violated by lies, but outraged by silence. When Barkha Dutt was caught on Radia tapes she lied by clinging on to the same phrase – ‘Error of Judgment’. I am not sure how far this jugglery justifies a lie. It erodes faith for sure. Bill Clinton lied under oath about his romp with Monica, Nixon lied but was not impeached, but the cake along with the cherry on top goes to President Bush who initiated a war citing large stockpiles of weapons of mass destruction in Iraq! A survey declares that ordinary people lie three times a day. And ordinary people do not include politicians, scribes, lawyers or movie stars. According to a book, “Born Liars’ penned by Ian Leslie, most of us are born liars. As we grow up so do our lies. From harmless white lies to necessary social lies, to the dangerous dishonest lies. I am not above board when it comes to fibbing. But mine are social lies, intended to please and compliment. The conscience is clear and intentions sincere. No offence meant, none taken. I do say, “Ready in five minutes”, knowing well that I will take another twenty minutes. However, I never lie in print, unless I am attempting fiction. Readers are unforgiving when it comes to fibbing in print. The social lies, however can be taken to another level when one artfully drops names or conceals ones age. My initial lies were perhaps in school. Once we returned late after attending a cousin’s marriage. Consequently, the following day I missed school. My father, a doctor, refused to sign on the medical application, “Go, and tell the truth.” As a result, I had to stand for forty minutes with my ‘hands-up’ by a merciless teacher. “Where is the medical certificate? Disciple is discipline,” she roared. So next time I missed school, I made sure that dad signed a medical certificate saying that the child is suffering from ‘low grade pyrexia’. Fever was too lame an excuse. The teacher couldn’t comprehend the term ‘pyrexia’ and gave me a sympathetic look… “Tsk, tsk..Hope you are fine, my child?” she cooed. Needless to say, my day was made. More forgivingly put, social lies are necessary for our existence. However one falsehood can spoil several truths. How about you? Are you above board? Honestly, haven’t you ever faked illness while remaining glued to the telly, watching that final. Or faked a smile and said that your mother-in-law is a wonderful cook! But then these are not lies, are they? What would you call them? Innocent misrepresentations of facts, harmless half truths, errors of judgment, little white whoppers, necessary fibs or plain and simple lies? as Sree Bhagwat Gita preaches, "lies aimed for betterment and saving lives are considered truths" so praising one's mom in law's culinary skills may not be a proper lie! hahaha! Very true! Each and every one of us lies -- whether in the guise of harmless lies or whatever. The big question is "Where do you draw the line?" For a marketer selling deo showing that women will drool over you if u use this deo, it is a business lie almost as important as you saying the party was good..For if you lie you only risk bein not invited to another party or may be called rude but if the marketer does not lie he risk losing his livelihood and remaining unemployed..So if you ask me he is well within his rights to lie..
Well written. :) It would become difficult to live if we were to speak the truth all the time. I don't find anything wrong with social harmless lies. But like you said, one falsehood can spoil several truths. We should rely on our conscience and wisdom to draw the line. Nice one , Yes lies has come apart of life in this very Kalyug ..whether its it in Business , the salesperson everyone ..has become a perfect lair. @AS...You have put it better than I could. @Rachna... some are necessary or we would be social outcasts. @perception...Thats the million dollar question. So many liars in this world. Even Maggi's ad is a pure dishonest lie. How the hell can Maggi get ready in 5 minutes? @Prateek...Kitne Deo khali kar diye? A guy called Vaibhav Bedi 26, has sought 26000 pounds from the Axe maker Unilever in Nov 2009 for the psychological damage that the lack of any such effect on him.He says I used Axe for several years but no girl came to me. Dont give up, keep dousing Axe...kabhie to effect hoga! its human to lie.. As i have written in my articles and what i wish is I want to be a good lier, its an art to lie and i want to learn it.. I never ever lie..haha...what a lie.. The social lies sometimes become very cumbersome...like I mentioned in my post..there are a whole lot of people who come n comment on our blogs...they may even say nice things, but in your heart you know what is genuine n what is not. as such the lies become a great put off...also the lies people show on the surface:a minute ago they'd be criticizing someone and a minute later talking animatedly with them...wish I could learn that! Lying is embedded in our nature..the extent varies from person to person. in our ordiary lives, we do not bother about it so much coz we are doing good or bad, just to us...however from a post of responsibility, whereby the people look upto u..it becomes a different ball game altogether. Bwahaha! You too fell for it. This fake news was written by India’s leading satire-sarcasm fake news website called fakingnews(dot)com. Half of the globe took this fake news for real. Even TOI printed this scoop on their front page. Have a read at this article written by the owner of this site; Rahul Roshan way back on Oct 19th, 2009 and here is a Press Release by him. But some, are a class apart, like politicians, most of them. I am a great social liar, but I try to find something to praise about the subject when I do. For instance, if I didn't like the food at a party, I might say, 'How wonderful the arrangements are!' and genuinely mean it. @Prateek: MAggi claims it cooks in 2 minutes, not five! How could you leave out " I misspoke the truth"! Franky we lie to please. Why hurt someone for the sake of conscienceis the commonest excuse we fall back on. Lying is convenient, so why bother with truth? I do not think anyone can claim never resorting to lie. If someone does, it is either a case of being hypocrite or biggest lie or being next to God. But as you said if a lie does not harm someone or peps up someone's happiness, it should be acceptable. I truely believe by hiding truth there will many other excuses I have to come out with...so try avoiding A lie and speak out the "Truth"
But social lies is something one can judge..
like a lousy dressed women ...people will say"hey you look nice..or dress is pretty.."for no reason it not required to speak or give your opinion.. I loved the 'low grade pyrexia' part. But yes, things have in general degenerated to a level where blatant lies are the least of the evils you have to contend with.